January sees a peak in search engine queries for ‘getting fit’ and intentions to complete the London Marathon. While you may be too late to enter this year, we have some suggested London running routes to help you get fit and see the sights. So you want to get fit(ter) this year? January always sees best intentions kick off but they don’t always convert into February and beyond. “Eat better” and “exercise more” occupied the top spots of YouGov survey respondents and their resolution intentions in 2018. We are all aware that gyms are at their busiest in January than any other time of year, so maybe ease yourself into the new year with a gentle run around town. At its simplest and cheapest a run is a great cardio workout that will help improve fitness levels. You may think that a 26-mile marathon run is too daunting a task ahead, but a marathon can be a good thing for the success rate of sticking to your new year’s resolutions as it creates a tangible experience-based goal. Climbing a mountain, running a marathon, these are specific fitness outputs that give focus, as opposed to “go running”. Try to break down that marathon end goal into a series of achievable results such as a 5k run, a 10k run, a half marathon etc. before you go in for the big event itself. The 2019 Virgin Money London Marathon will take place on Sunday 28 April 2019, and so you will be unable to enter this year. But there is nothing to stop you hitting the streets of London and getting marathon fit in 2019, ready to apply for next year. A 17-week training program is suggested by the London Marathon organisers on top of a 4-week foundation of regular and steady running, to get you Marathon ready. We have some routes that have been designed and run by London’s running community that take in the sights of the city and some Barratt London developments along the way too. 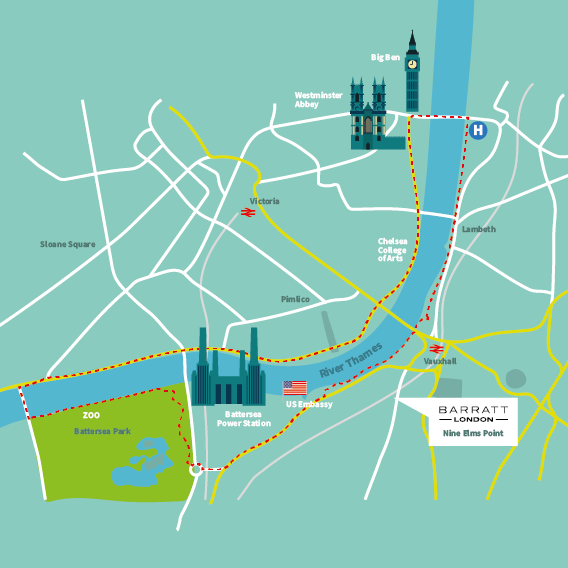 This run is a simple matter of following the Thames Path on the river’s south bank, taking in the monolithic Battersea Power Station and heading all the way round to the north-westerly corner of Battersea Park. At the far end of the park, cross to the north bank via the impressive Albert Bridge. Then follow the waterside pavement all the way to Big Ben. Having crossed the bridge return towards Barratt London’s Nine Elms Point via the riverside path through Lambeth and Vauxhall. Start at Barratt London’s Hampstead Reach and make your way towards Hampstead Pergola and Hill Gardens – they are hidden away at the top end of the heath. Covered in exotic flowers and overgrown vines, this oasis of calm and tranquillity has been in existence since 1904. Continue to Parliament Hill where you’ll be rewarded with stunning views of the London skyline. As you reach the last leg of your journey enjoy the scenes of Hampstead’s famous swimming ponds. With Barratt London’s Lombard Wharf a striking structure on the south-side of the Thames and Barratt London’s Fulham Riverside across the water, running the Thames path away from Central London you will slowly see the city melt away as you run alongside pretty wooded parks. In some places the path changes from pavement to dirt, providing some relief for the joints. We selected Richmond as our finish where you can have a bite to eat before you take the tube back. Starting in vibrant Camden from Barratt London’s Camden Courtyards, you can quickly find yourself in what was once a hunting ground for Henry VIII. Today, Regent’s Park offers a generous mix of open fields, Queen Mary’s Rose Gardens, a running track, cafés, and London Zoo. The pathways through Regent’s Park offer level terrain and even pace but if you want to push yourself and unlock a stunning view reward, you can also run up Primrose Hill.